Check out the 2017 ebook version of this post! 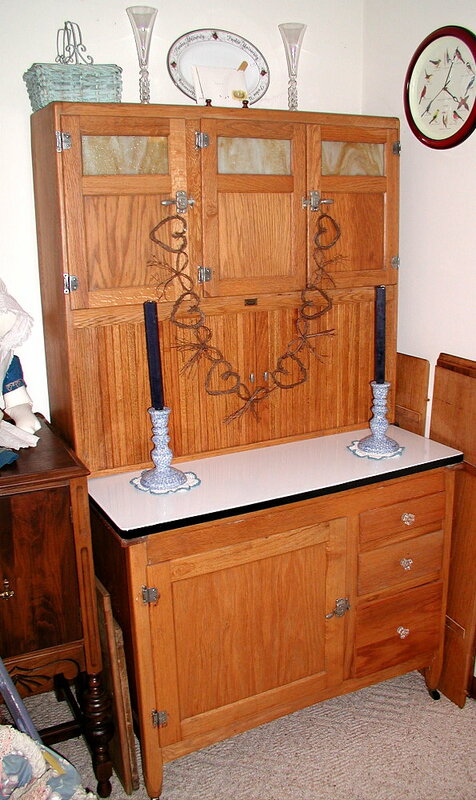 Back when our furniture refinishing and antiques business was truly "on the road," I used to have a scrolling news page at http://www.secondlooks.biz/ called On the Road with a running account of our activities. 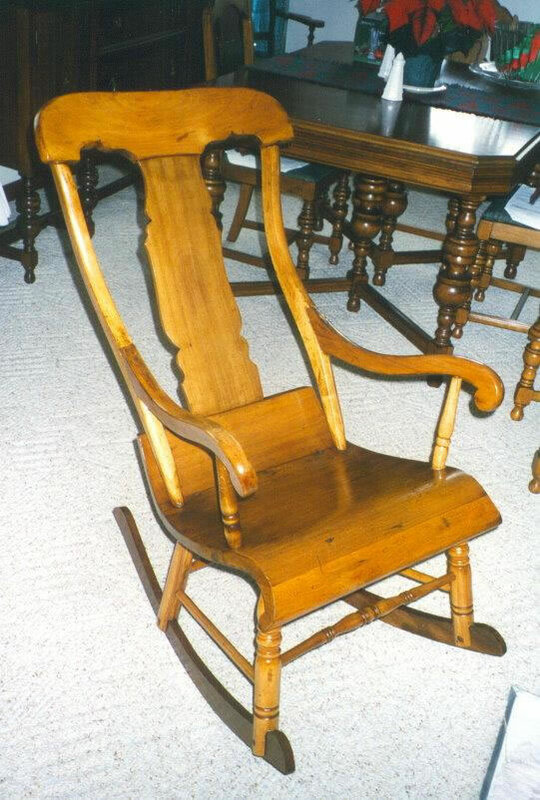 When we cut back to do just the refinishing and caning work (after Benny's heart surgery), I took that page down. 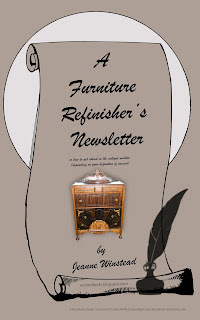 But now that I have this blog site, and because it's "that time of year (when people write newsletters)," I thought here might be a place to maintain news about our furniture refinishing business. This has certainly been an exciting and historic and, financially, a difficult year for all of us, hasn't it? 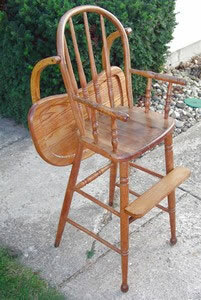 We have not participated in any shows or had any ebay activity this year, but Benny stays pretty busy refinishing furniture and caning chairs. 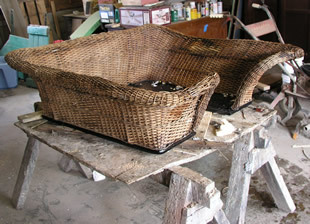 Here's a picture of a wicker seat from a governess cart that he repaired this summer. Unique! 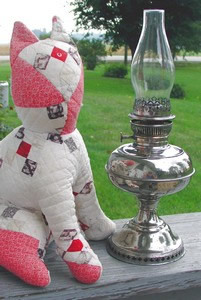 Keep an eye out for our upcoming ebay sales - kitchen cabinet parts, old porch lamps, a Victorian Clock Shelf, and some great vintage clothing. October Garage Sales a HUGE Success! Well, we had our last garage sale of the year October 21-22! Saturday started out cold but warmed up nicely. Seven cars pulled in ten minutes after we opened our door! Sunday was cold, rainy, and windy and we thanked our lucky stars for a nice enclosed barn, a couple of heaters, and hot coffee and cold cider and Pay Less's left over Caramel Apple Cream Cake and two bite brownies and those yummy taffies with the peanut butter centers in orange and black wrappers that appear around Halloween and Manning's Maple Cookies from Canada (delicious!) from the dollar store and the three or four shoppers we had that day. The best things in life may not always be free, but they don't have to be expensive! 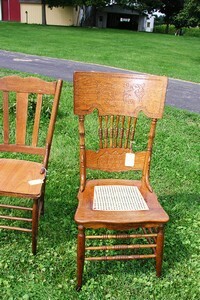 Two more families set up with us, so we had lots to offer and sell. 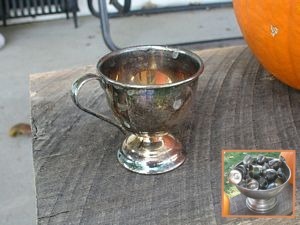 Jeanne sold her Royal Winton china and her two demitasse sets with mixed feelings - but she was happy they found a home. We'd like to thank our participating families and all who came and shopped for helping us make our barn and garage sales a success. It was fun meeting you all! Simply a GORGEOUS weekend for the Feast of the Hunter's Moon, October 7-8, and a little windy and cool for the start of the Bridge Festival the weekend of the 14th. But Second Looks had great barn sales both times and we're looking forward to the next one! 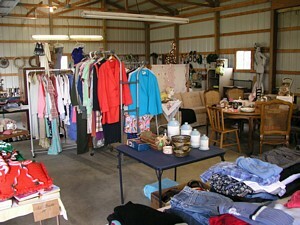 Our next barn sale will be October 21-22 depending on the weather. 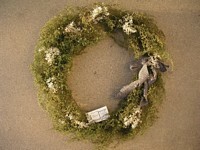 We hope it's nice for the Bridge Festival's sake. 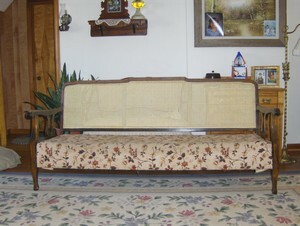 We have two other families who have set up with some great items so we still have lots of items to offer - an English saddle and boots, a ping-pong table, a washer and dryer, a truck bed, a truck bed tool chest, Christmas items, a microwave oven, craft supplies, clothing, furniture, antiques, linens, books, home furnishings, kitchenware, and antiques. September Garage Sales a HUGE Success! 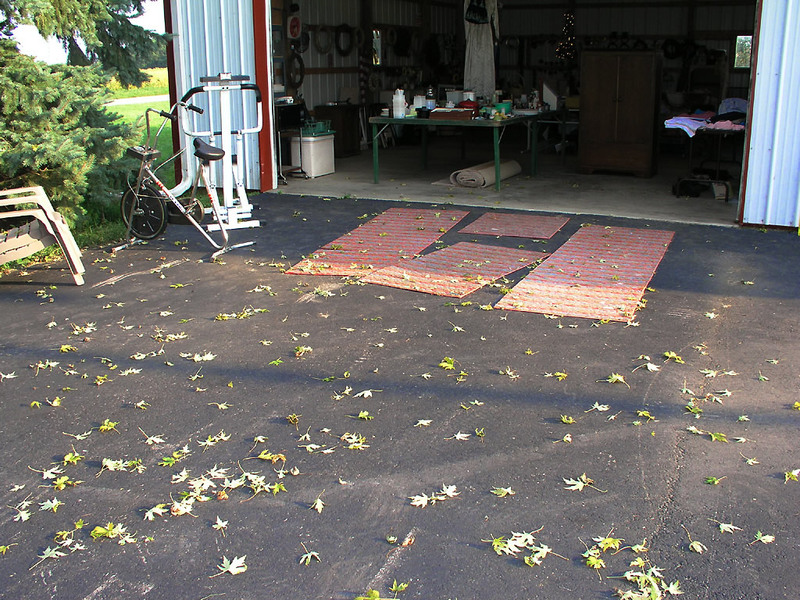 We had two great three day garage, barn and yard sales in September! The weather was gorgeous, and the rain held off. Our friends and neighbors - Mark, Marilyn, and Judy and Charles - set up alongside us- so we had lots of different things to offer people. We had good prices and many people stopped to browse, to visit, and to buy. Jeanne actually met up with a classmate from her high school days! 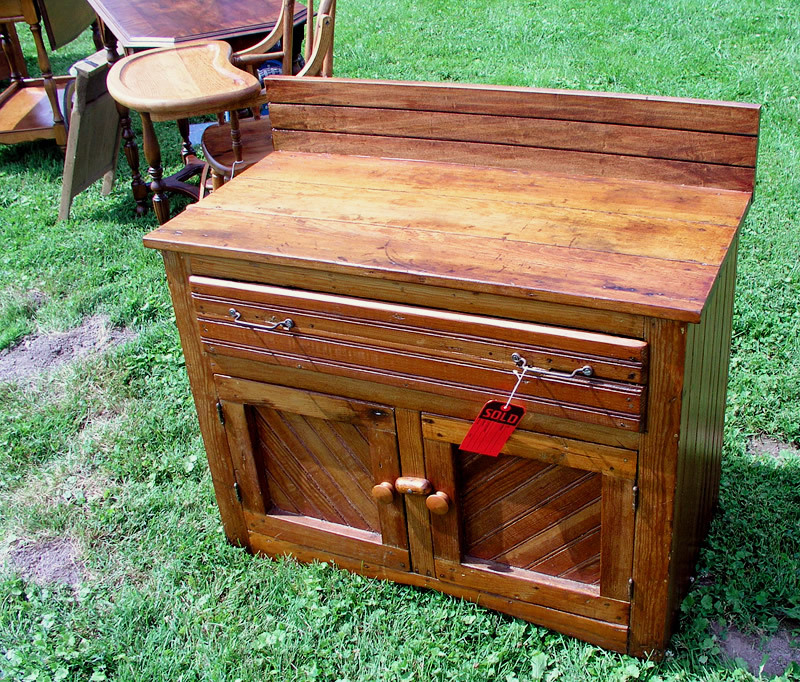 She also started restoring an antique sewing cabinet - tiger oak! 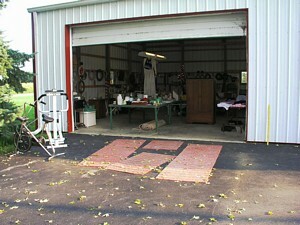 We sold carpets, a lawn mower, clothing, a sofa, a restaurant booth, antiques, exercise equipment, and many other items! Watch for the flags on the wagon! 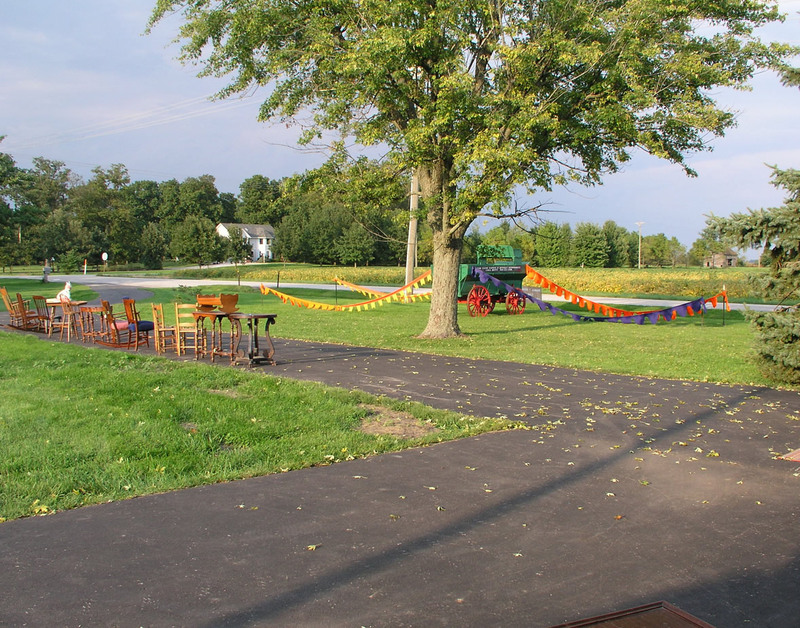 Trial Run in August and Fair Weather Yard/Barn Sales in September and October! 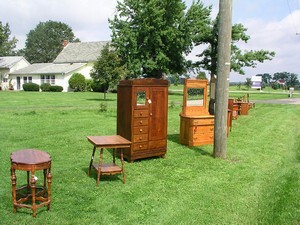 We had our first "yard sale" this August in our new location! 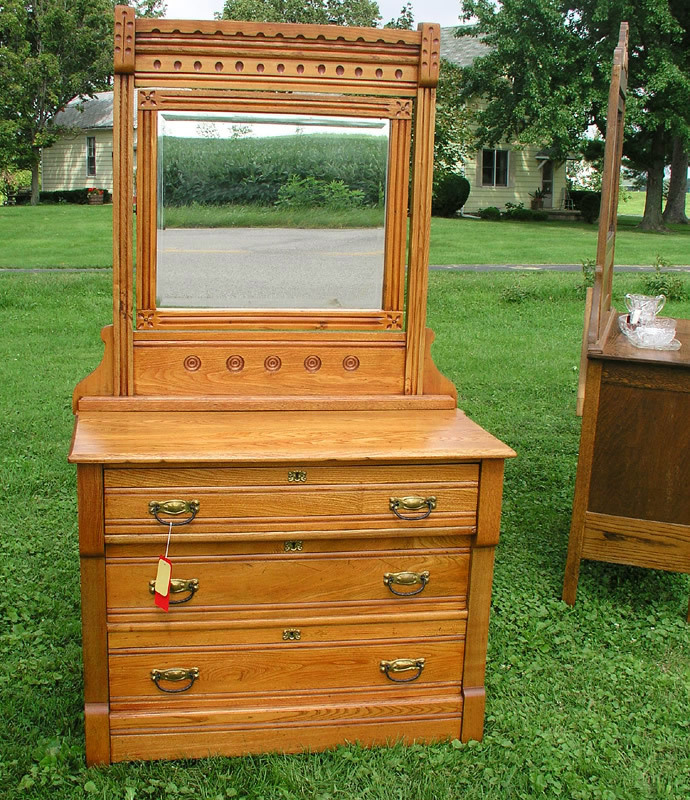 We sold a fine old Victorian Eastlake Dresser, a very unusual old Pressback Chair, and a Primitive Beadboard Washstand, and an old Washboard. 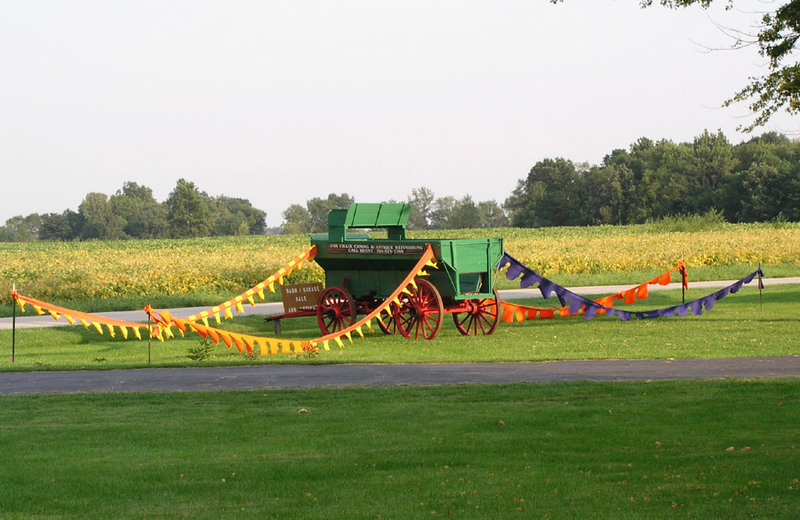 Now that all the summer parties and reunions are past, Jeanne's getting the barn ready for a full scale barn and yard sale. We are planning for another run on September 9th and 16th, 8-6, and two more in October! Stay tuned for further details. There will be clothes, craft supplies, linens, dishware, furniture, microwave and other appliances. 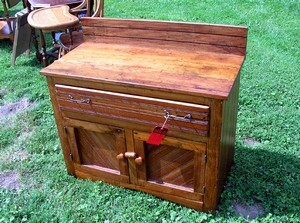 Benny's also been working on some very nice antique furniture including a cedar lined chiffarobe. Best of all, there will be good bargains and good prices. 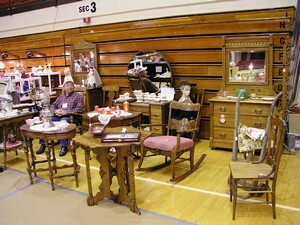 Lafayette Jeff High School's Spring Antique Show! The Lafayette Jeff High School Athletics Boosters Club sponsors two annual antique shows in the Lafayette Jeff High School gymnasium that are widely known and usually booked solid. One is in the fall and one is in the spring. Benny and I lucked out this year - someone canceled and we got a booth for the spring show Fri April 28 6p-9p, Sat April 29 10-7, Sun April 30 11–4p. It was a gorgeous show. Rainy weather on Saturday and Sunday didn't deter shoppers and we sold a Duncan Phyffe parlor table from the auction of the old Sportsman Bar in Monticello, a rare beautifully restored black compo doll, an early 20th century elevator cart, a Summertime Royal Winton plate and salt shaker, and several other items, including some very unusual postal railway magazines from the 1930's and 1940's. Jeanne's granddad worked the mail on the trains - specifically the Chic & Cinn (Chicago-Cincinnati) run for most of his career. It's a small world because we ended up in a booth beside one of Jeanne's high school classmate's (actually that's who bought the Duncan Phyffe table)! It was a mini high school reunion! 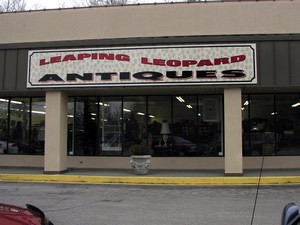 Now that Second Looks has moved to larger facilities, we are changing our arrangment with Leaping Leopard Antiques. 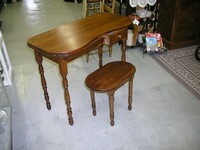 Instead of maintaining a booth, we will be featuring various pieces of furniture and antiques on consignment there. So be sure to drop by and browse the store. 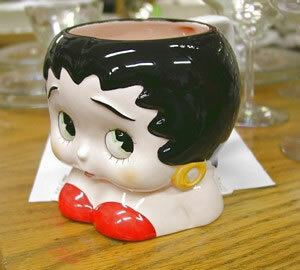 They have many wonderful pieces, and you never know in what corner you may find your next treasure! Benny's on the mend from his valve replacement surgery in January! We've FINALLY "hung our shingle" out at our new place! Well actually it's a wagon, not a shingle. But it's freshly restored and sitting out in our new yard and Benny's been getting inquiries and REFINISHING SOME BEAUTIFUL PIECES! We're in the process of weatherproofing our new pole barn and plan to have a garage/barn/antique sale sometime in May, we hope - so stay tuned! Great Moving Sale at Countryside Antique Mall! Second Looks is closing its booth at Countryside Antique Mall at the end of November. Now that we have better facilities, we need to focus on the refinishing side of business closer to home. 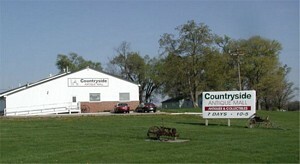 However, we do thank the folks at Countryside for a great three years there. It was lots of fun! We will be having a 25% moving out sale in our booth through November 27th, so drop in for some great bargains and don't forget, we still have a booth at Leaping Leopard Antiques! New Address! New email! New URL! 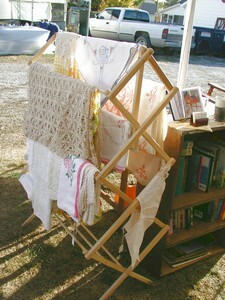 May 1 we set up in the Leaping Leopard Antiques parking lot for their Flea Market and Antique Car Show. It was a sunny Sunday and oh, so windy! 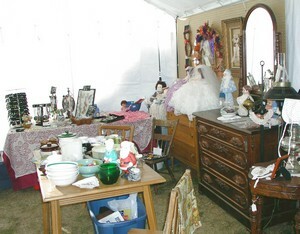 Also going on was the Tippecanoe Fairground's first outdoor flea market of the season- so many people hit both places. 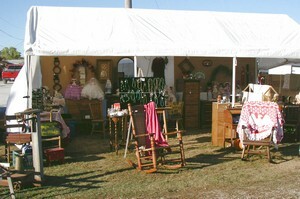 The Fairground flea markets take place the first Sunday of each month, 6a-2p. 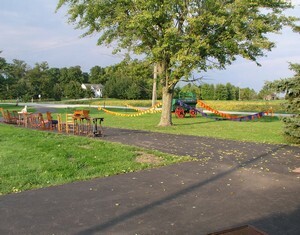 The Fairgrounds are located in Lafayette IN on Teal Road between 18th and 9th street. need directions? In January in addition to our booth at the thriving Countryside Antique Mall, Second Looks will be opening a second show room at a GORGEOUS new Antique Mall Leaping Leopard Antiques! This mall spun off Lafayette's Shabby Chic Antiques (formery at 9th and Kossuth) and opened its doors in 2004 in a spacious facility in Three Sons Shopping Plaza next to The Olde Country Restaurant. Parking is plentiful and convenient! We got home January 15th to ice, snow, artic temperatures, and flooding after spending almost a month on the east coast visiting family for the holidays. 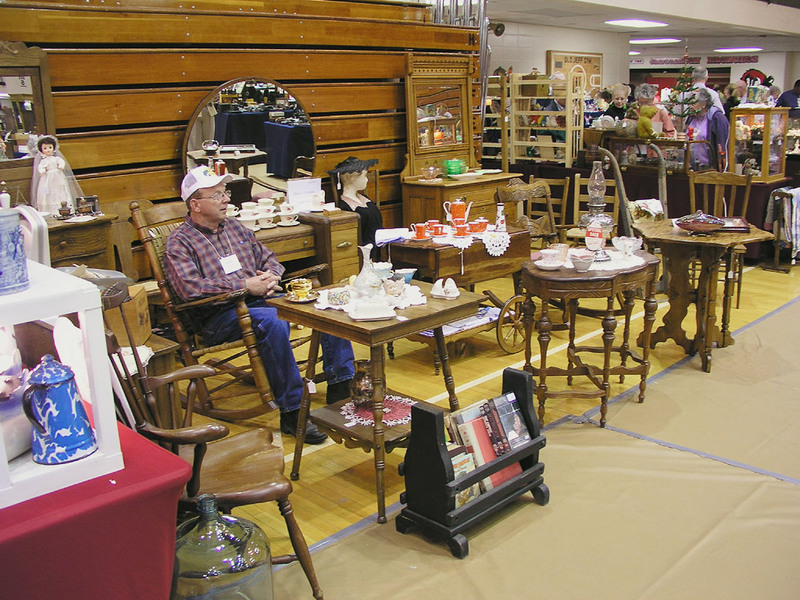 Of course we kept our eyes open for antiques and collectibles during this period and managed to bring back several nice linens and other items from New York and South Carolina for our booth at Countryside Antique Mall. We've been selling (and buying) on ebay for a while, but in December we made our first internet sale directly from our own Second Looks web site! On our way to New York to visit family for Christmas, we delivered the kidney-shaped vanity and bench at Countryside Antique Mall to a customer in New Jersey who found us on the web! 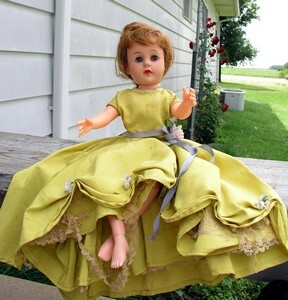 Be on the lookout for some gorgeous items from Second Looks at Countryside Antique Mall, at shows, or on ebay this holiday shopping season and beyond! Benny recently visited with friends Denis and Judith who retired and downsized from their home on historic 9th Street Hill in Lafayette, Indiana. 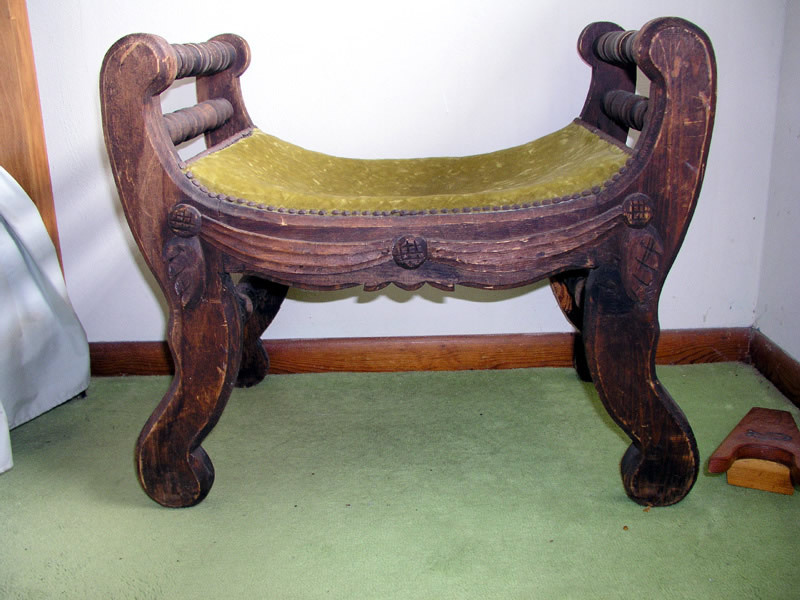 Benny bought a cherry gate leg (rope) table with four matching chairs (also rope), a dolphin dresser, and a marble -top Victorian walnut bureau from them, just to mention a few items! Hopefully, pictures will be available soon! And of course Jeanne had to scour ebay and the Bridge Festival for furniture, glassware, and linens for the Countryside Christmas shopping season. 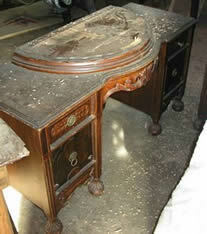 At the Bridge Festival she found an old pink art deco desk with bakelite handles! 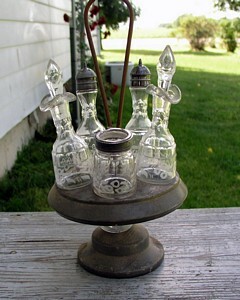 Judith and Denis may even grace our booth at Countryside with some vintage green glassware this November! Another 10-day Covered Bridge Festival come and gone. We set up our tent at Janet's Flea Markets at Veedersburg on Thursday, October 7, and were open for business Friday October 8. 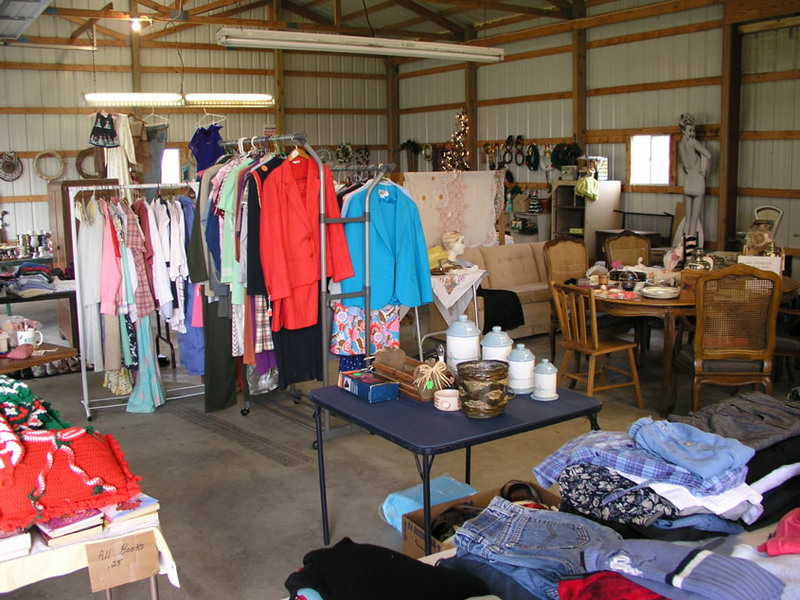 Janet's Flea Market is located at 305 Sugar St., Veedersburg, IN 47987 (take interstate 74 exit 15 onto U.S. 41and proceed 1/4 mile south to highway 136). Next year we'll set up even earlier! We had a sunny, warm weekend, followed a week of wind, cold, and rain. Just the weather for colds! But the vegetable beef soup I took home for dinner one evening from one of the food vendors hit the spot and saved the day - as well as the chicken noodle soup Benny brought from Shellie's Cafe! Thanks also to our friendly food vendor for helping out in other ways such as lending us tools, and even helping me load a heavy dresser for a customer! All the folks who set up at Janet's Flea Markets are so friendly and helpful. A special thanks to our neighbors Sharon and Shirley for watching our booth the days I was alone and needed to step away as well as helping in many other ways - and a special thank you to Sharon for that fabulous mouth watering apple dumpling! 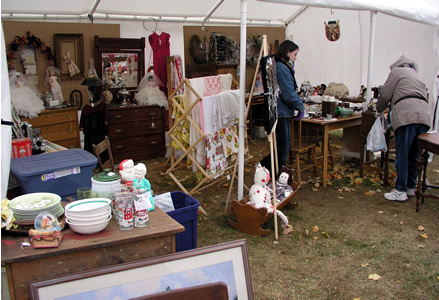 Be sure to come next year and check out their booths - Shirley has a huge variety of antiques and collectibles, and Sharon does wonderful crafts and ceramics! All in all we fared well, even though we weren't able to be open as much because of the weather. Wednesday evening, Jeanne closed up early and headed down to Wallace to visit an old high school friend. If you want a beautiful fall drive, turn east off 41 onto 234 and head towards Wallace (3-5 miles). The drive is absolutely breath-taking. Jeanne grew up in that area and says the woods seem twice as full and the trees twice as tall as when she was a young girl! 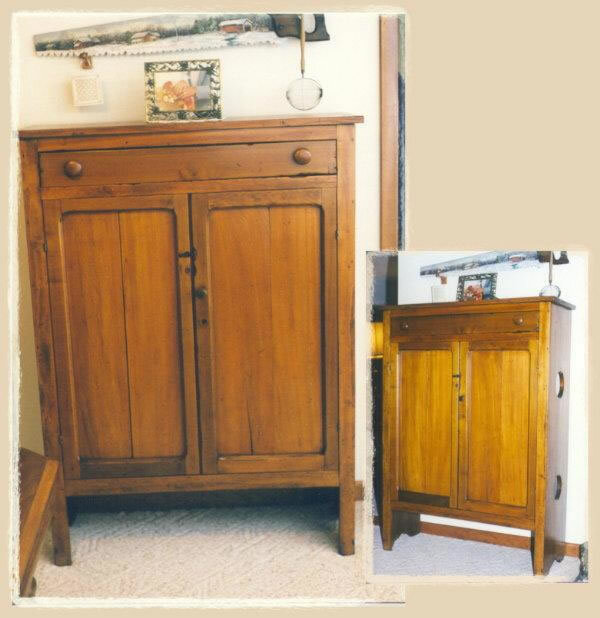 We sold the 30's walnut dresser and vanity set with the semi circle lids and the sunburst veneer pattern (shown further below on this page) the first day, before Jeanne could even get pictures. In fact the lady came back for them, and Benny wound up following her back to Indianapolis with the trailer because she didn't have room in her car. We also sold the 1860s carved walnut dresser (shown further below on this page) later in the week as well as many other pieces of furniture, primitives ( among them a corn sheller, a sausage grinder, a grain scale, and an old bob sled with a Model-T steering wheel - again alas before Jeanne could get pictures), linens, and dishware. Our next door neighbor Judy Gustafson packed us a picnic lunch and came along with Bob and me on a rainy Tuesday. She had great success selling her walnuts, $1.00 a pound. We also had a section for our friend Tara's jewelry. Tara puts together a beautiful presentation - and it was our challenge to make sure the wind didn't wreak havok with it during the week! Our friend Bob threw in with us again this year. We couldn't have done it without him. 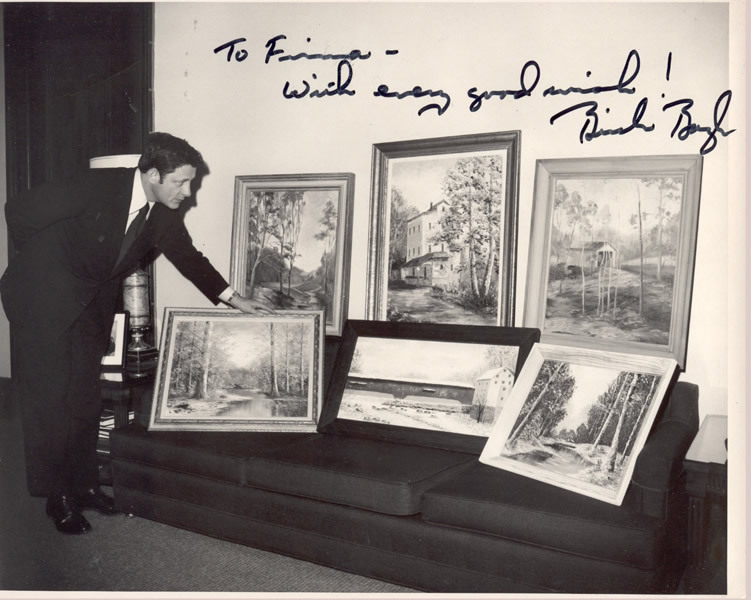 He helped us so much, and also sold many of his items - so we had a lot of inventory! In fact, after three rain showers on Tuesday, Jeanne sent Bob on a run to the hardware store in Veedersburg to buy some rope and a roll of visqueen and clamps, so that we could cover the furniture when it rained and still have room inside the tent for people to shop! At last! 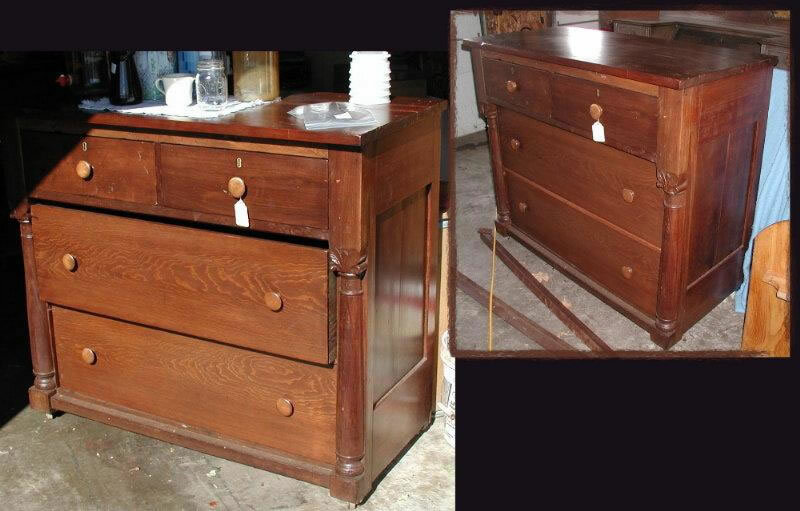 Benny's refinishing the old chest and vanity with the circular lids that Jeanne bought at auction last year! Watch for them at the Covered Bridge Festival at Janet's Flea Markets this October 2004 or at Countryside Antique Mall's Holiday Open House! 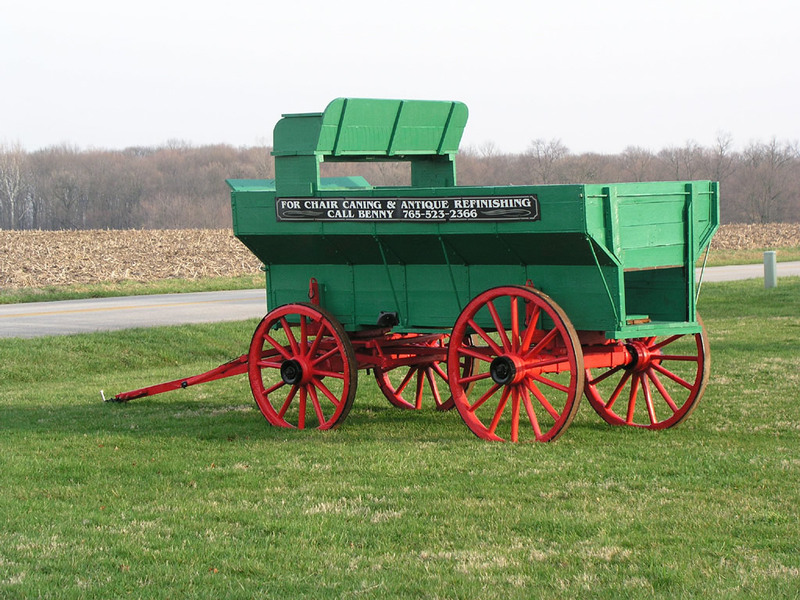 In July Jeanne attended an estate sale in Tippecanoe County conducted by Alan Goetz Auctions. 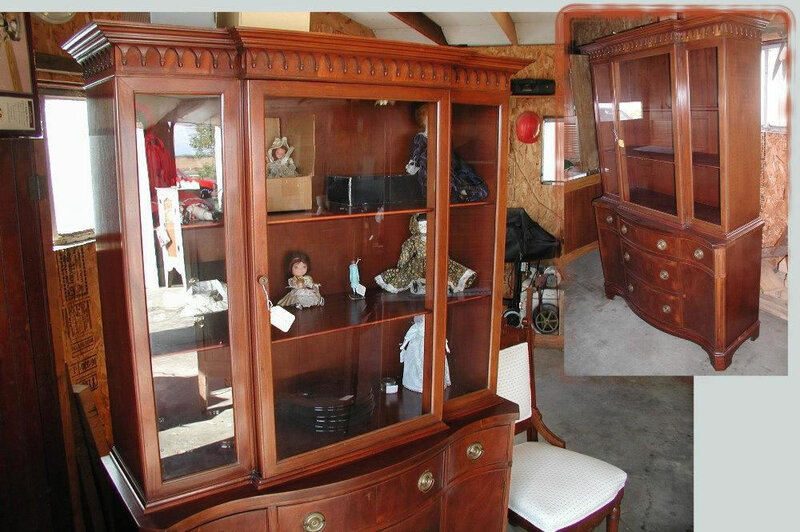 She acquired a very unique old oak marble top bureau with a swivel mirror which was in pieces but with Benny's genius now looks like this! 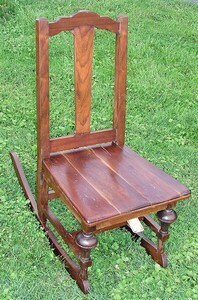 She also acquired a very old high chair (which was in pieces as you can see from the picture below) but now with Benny's genius has a new life (as you can also see from the picture below), and a gorgeous and very solid walnut chest of drawers -all circa 1900's as well as a Rayo lamp and other collectibles. 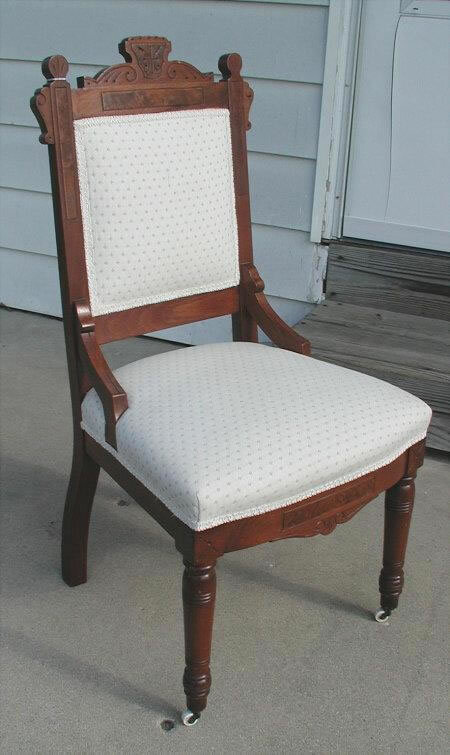 Once Benny puts all the furniture all back together, we will have some gorgeous pieces to show at the 2004 Bridge Festival at Janet's Flea Market or at Countryside Antique Mall! That is if they don't sell before we get them there! 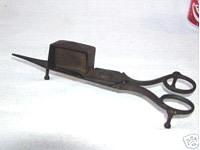 In early 2004 Jeanne continued to shop ebay and other places for unusual collectibles and antiques to sell at our Countryside Antique Mall booth and at the Bridge Festival, such as this 19th century candle snuffer (she also has a deep affection for vintage bride dolls and Betty Boop). 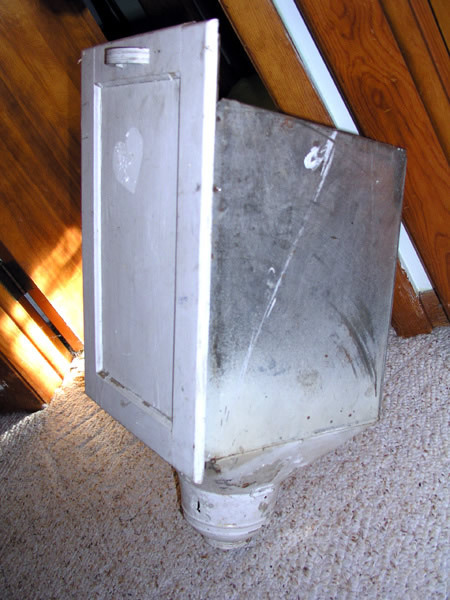 Our virtual season ended in December with the sale of an art nouveau deco vanity, a primitive empire curved bench, and a Hooser Cabinet pullout flour bin on ebay. Plus Jeanne bought a slew of stuff on ebay to sell at our Countryside Antique Mall booth during the holiday season and in 2004. We finished out the physical season with a booth at Janet's Flea Market for the 2003 Rockville Covered Bridge Festival October 10 - 19 The weather was absolutely gorgeous! 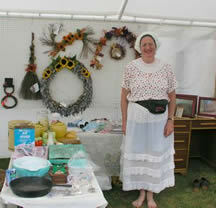 Jeanne wore shorts (and various articles of vintage clothing) and went barefoot that first weekend! Then the temps dropped and wind and rain took down some of the leaves, but the second weekend turned out to be as pleasant as the first! Our friend Denise threw in with us with glassware, books, and jewelry - she contributed the display tables which were a huge help! It was an eventful week. In spite of Benny coming down with the flu and then having an emergency angioplasty ( =:o ), we did pretty well, thanks to some wonderful friends Bob and Marilyn who helped out at the booth all week. Thankfully Benny came through the procedure with a clean bill of health! Tuesday was cold, windy, and rainy. Everyone secured their stakes Monday evening and put things away, and no one opened on Tuesday. Everyone was relieved to find their tents standing intact when they arrived on Wednesday. 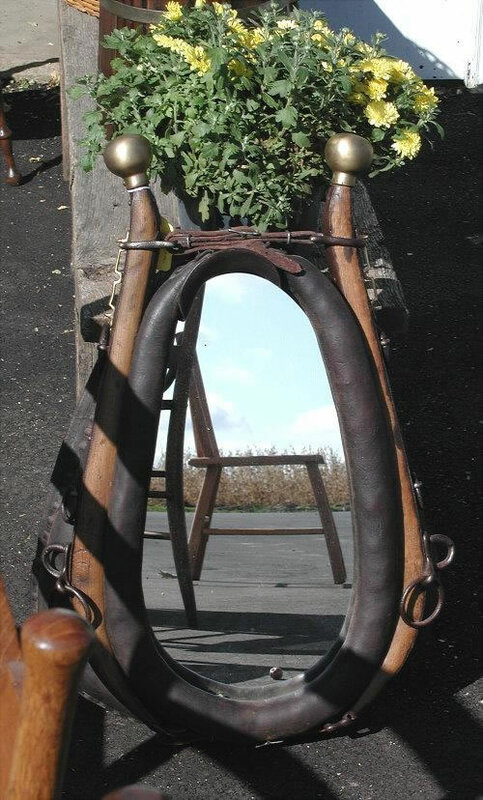 We sold the old steamer trunk, the harvest table with the six rose leaf chairs, the horse hames mirror, the old high back rocker, and numerous other items, like Jeanne's Sweet Annie wreaths. 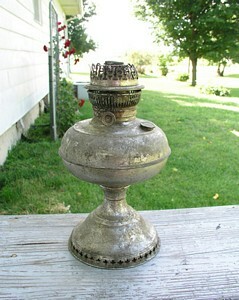 Jeanne also found some great stuff for our booth at Countryside Antique Mall! 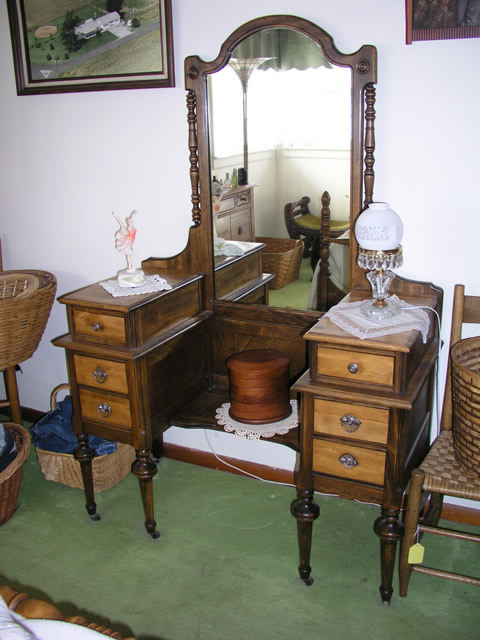 However, some items may be difficult to pry away from her ... like this dainty kidney-shaped dressing table, for instance. :) It's sooo convenient and functional for our little ranch-style home! 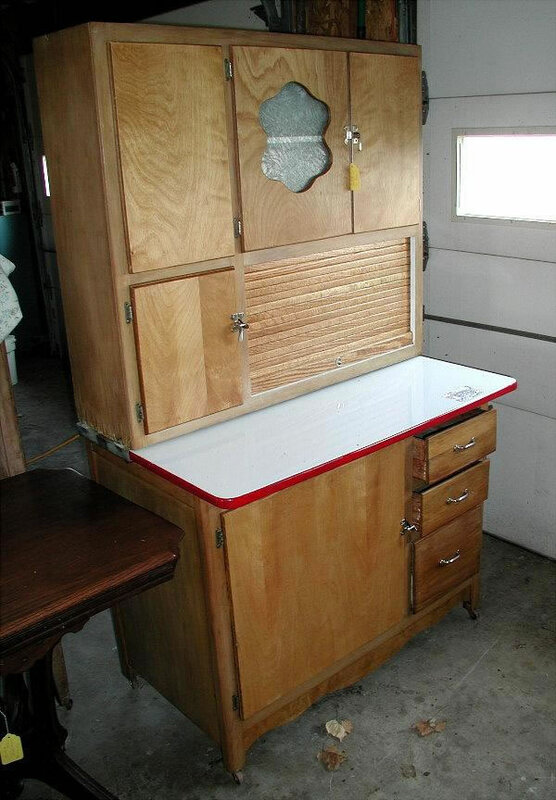 Notice the apron arms which hide the drawers. 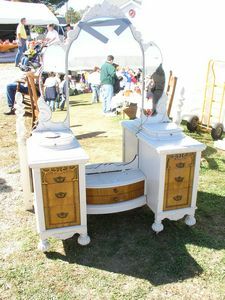 By the way, you can find a nice variety of antiques, collectibles, glassware, furniture, and crafts at Janet's Flea Markets (directions) every Memorial Day Weekend, July 4th, Labor Day Weekend, and the Covered Bridge Festival. We now have a physical showroom (which means we will be giving up our ebay store for the time being)! 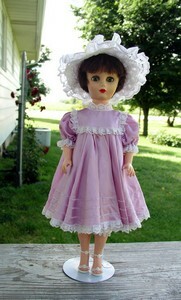 We rented Booth 19 at Countryside Antique Mall and will move in March 1st. 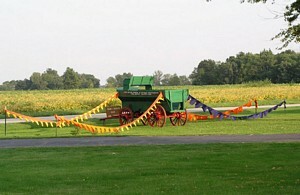 Countryside is in a lovely rural setting just off US 52 outside of Thorntown. We hope everyone had a joyous and blessed holiday season and wish everyone a happy and healthy New Year! New Years Day 2003 found us selling a 1940's Hoosier-style cabinet and other furniture at The Auction Gallery (located at the intersection of US 231 and Teal Road, Lafayette Indiana). We finished our "physical" Flea Market schedule with a great 10 days at Janet's Flea Markets, Veedersburg, Indiana (need directions?) from October 11-20, 2002, during the Rockville Covered Bridge Festival. 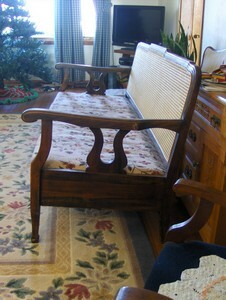 While there were some other very unique pieces at Janet's, including a 1901 patented music chair (! 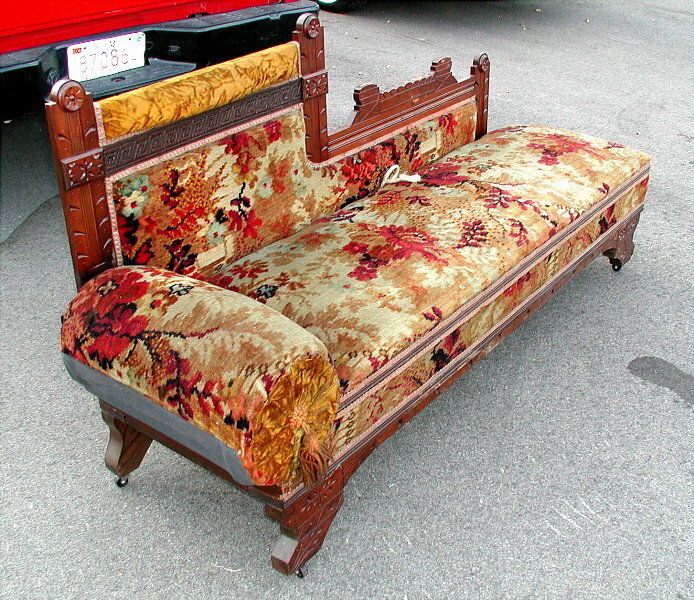 ), Our friend Denis's Victorian fainting couch/fold-out bed attracted a lot of attention and sold on the third day, and we also sold a set of lovely oak antique press back chairs before I had time to put them up on the web site. 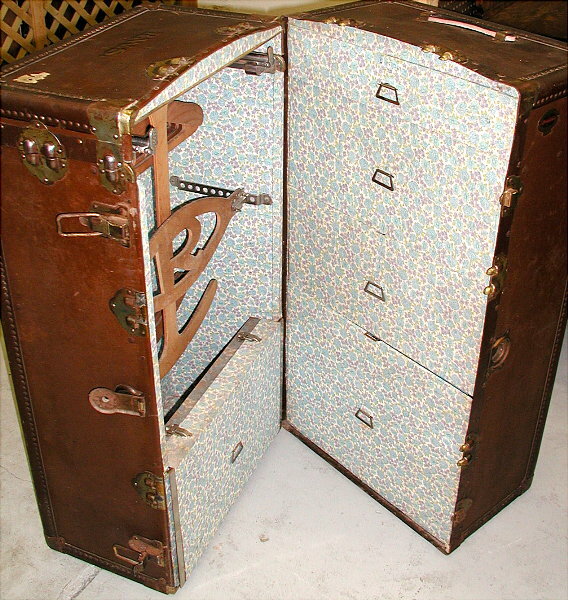 Second Looks hit the "virtual road" this year and sold several pieces of furniture over eBAY - a mahogany china cabinet to a couple in Illinois, an Eastlake Victorian parlor chair to a physician in New Jersey, and a Sellar's kitchen cabinet and an old Primitive Jelly Cupboard to a designer in Michigan. 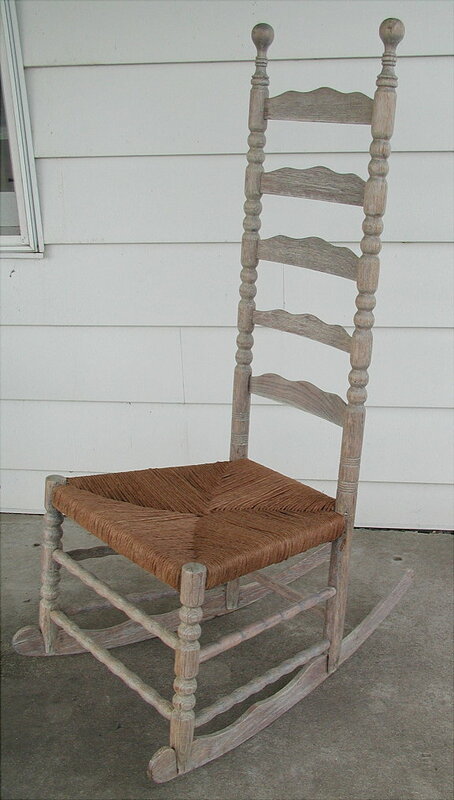 A set of ladder back cane bottom chairs went to Sweet Water, Alabama. We've also opened an ebay store! The weather was fair for Lafayette's Feast of the Hunter's Moon, and lots of folks also showed up at the Tippecanoe County Fairgrounds on Sunday, October 6th! This was the Fairgrounds' last outdoor flea market this year, however, they will host a monthly indoor flea market in two buildings from November through April. 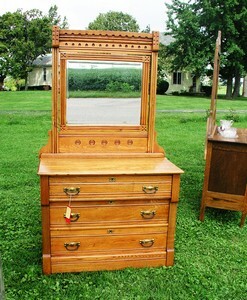 One of the items we sold at the Fairgrounds this summer was a beautiful old walnut dresser. 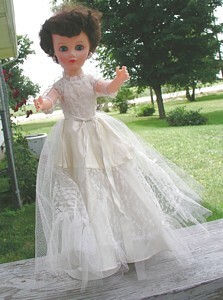 We showed at the Schuyler Avenue Flea Market at Star Lanes Bowling Alley in Lafayette, Indiana on Sunday, September 8. This was the last flea market of their season. 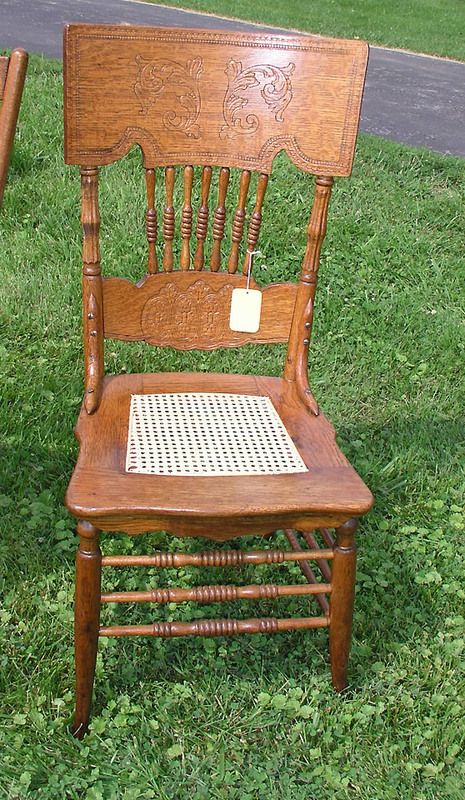 We sold several pieces at the Klondike Road Flea Market Grand Opening including a very nice old maple splat-back Boston Rocker, August 23-25. 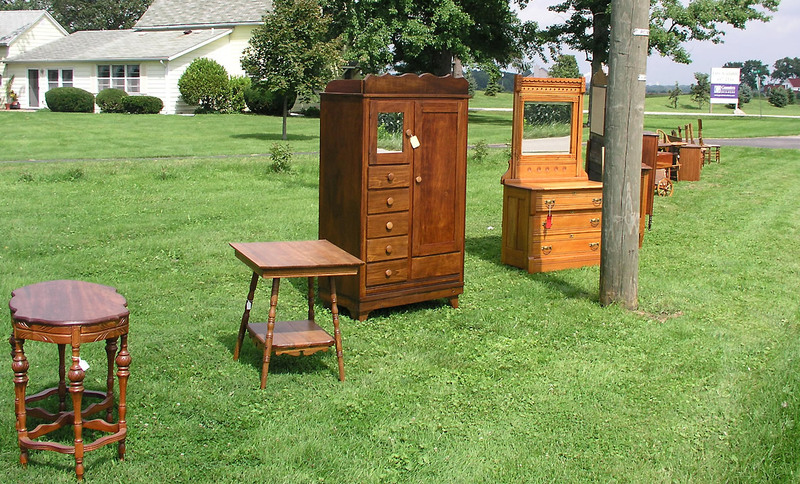 This outdoor Flea Market located on 2780A Klondike Road, West, Lafayette, IN, runs every weekend, Sat and Sun 8a-3p during spring and summer. We're ready for the big time now! After getting our feet wet selling a treadle sewing machine and bedroom set at Lafayette Jefferson High School's famous semi-annual Antique Show athletic fund-raiser, selling a set of six gorgeous pressback chairs on ebay to a lady north of Boston, and trying out the monthly flea market at the Tippecanoe County Fairgrounds, we set up for the 2001 Farm Progress Show which was just down the road from us, and showed at the Rockville Covered Bridge Festival for the first time ever. 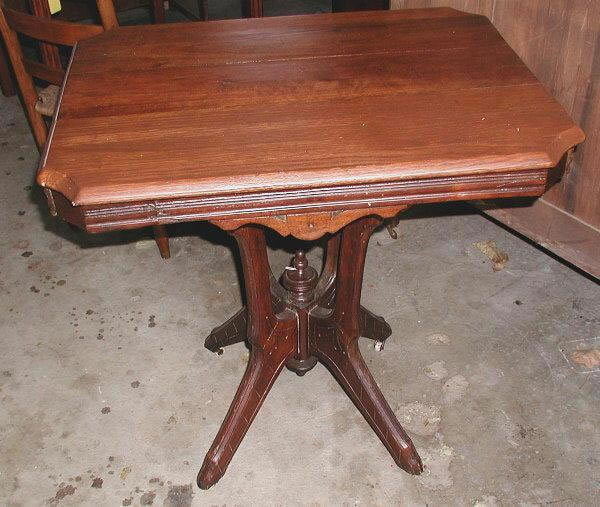 We also sold a walnut eastlake victorian parlor table at the monthly Monticello flea market (in the armory) and participated in the monthly Flea Market and Antique Show at the Indianapolis Fairgrounds this past February and March! 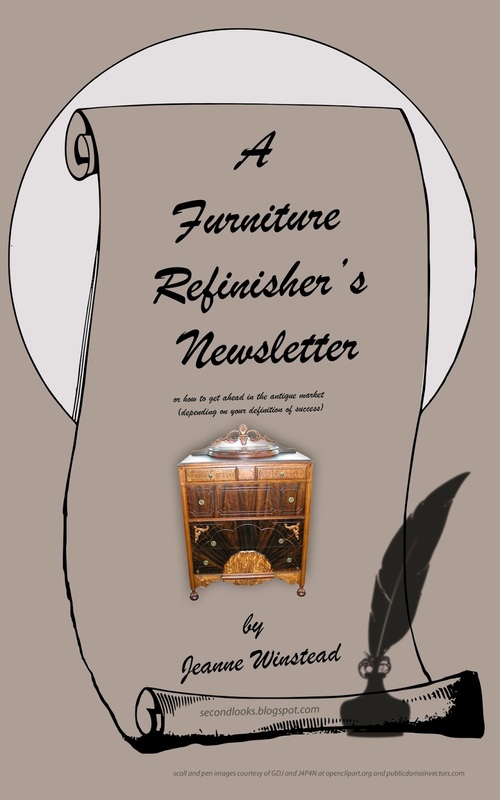 The expanded 2017 ebook version of A Furniture Refinisher's Newsletter is now available at Amazon and Google Play Books! Spacify is one of the best onlineFurniture Shops that provides you quality furniture for your home.